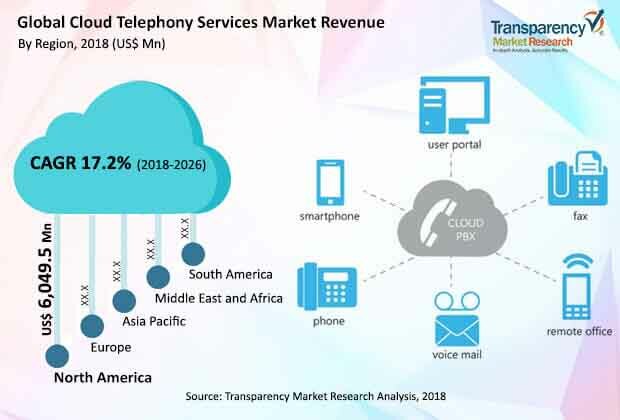 The cloud telephony services market can be segmented based on deployment, enterprise size, network, application, industry, and region. There is high demand for cloud telephony services from multiple industry verticals including BFSI, telecom and IT, health care, retail, government, media & entertainment, education, and others (transportation and manufacturing). The IT and telecom segment held a prominent share in cloud telephony services market in 2017 and is also expected to show sustainable expansion during the forecast period. Rapid expansion of the BPO industry and fast growth in network services developments such as VoIP services and IP network have largely contributed to the penetration of cloud telephony services across different regions. Cloud telephony has been evolving as a cost-effective solution to offer an effective communication network. The health care, retail, and education segments are anticipated to offer lucrative expansion opportunities in cloud telephony services market. In terms of adoption of cloud telephony services, the health care sector is projected to expand at a CAGR of approximately 19% during the forecast period from 2018 to 2026. Demand for cloud telephony services in Europe is likely to increase as leading telecom players migrate their customers to IP networks. The market in the U.K., Germany, and France is expected to offer lucrative opportunities due to the phasing out of Integrated Services Digital Network (ISDN) lines by telecom operators in these countries. Asia Pacific is anticipated to be a high potential region of te market for the cloud telephony services during the forecast period. Rise in investments in the commercial sector and on-going network infrastructure developments in the developing countries such as China, India, and Philippines are anticipated to favor the cloud telephony services market in Asia Pacific during the forecast period. High concentration of IT and telecom companies and network developments in the U.S. are aiding the adoption of cloud telephony services. Moreover, the rise in number of contact centers across North America is expected to contribute to the cloud telephony services market. Integration with web real-time communication (WebRTC) and session initiation protocol (SIP) to support bring your own device (BYOD) are the key trends influencing the market expansion in the region.